1. Welcome to STAR 1-4! The STAR 1-4 program is an exciting part of the Skate Canada competition system that introduces young figure skaters to competitions. The philosophy of the STAR system is based on the principles within Skate Canada’s Guide to Long-Term Athlete Development (LTAD). This guide provides the optimal framework for how young skaters should experience their first competitions. Sections may choose to offer all STAR events, or a selection of STAR events based on the size of the competition and anticipated number of entries. STAR 1 Assessed to standard Element event Introduction to a figure skating event. Focus is on individual performance. STAR 2 Assessed to standard Program event Introduction to skating a program in a figure skating event. STAR 3 Assessed to standard Program event Skating a program with increased difficulty. Same technical content as STAR 4. STAR 4 Ranked Program competition Same technical content as STAR 3. Introduction to competing a program in a competition setting and being ranked. Elements are assessed to standard and converted to a rating. STAR 1 is a group element event for entry-level figure skaters. The purpose of STAR 1 is to introduce skaters to performing elements in a non-competitive and fun environment. At the conclusion of each STAR 1 event, skaters are given a report card and ribbon corresponding to their overall assessment rating. Creating an atmosphere which is relaxed and encourages participation is of paramount importance. During the STAR 1 event, each group of skaters takes to the ice with their coaches to warm up elements in the designated warm-up area. After the warm-up is complete, coaches lead skaters to the assessment area where skaters take turns performing a stroking exercise, 3 jumps, 2 spins, spirals and a creative expression exercise. As soon as the first group completes the assessment of spins, the next group may enter the ice to commence their warm-up. STAR 1 may be conducted as a single panel format, or a double panel format depending on ice-time availability. 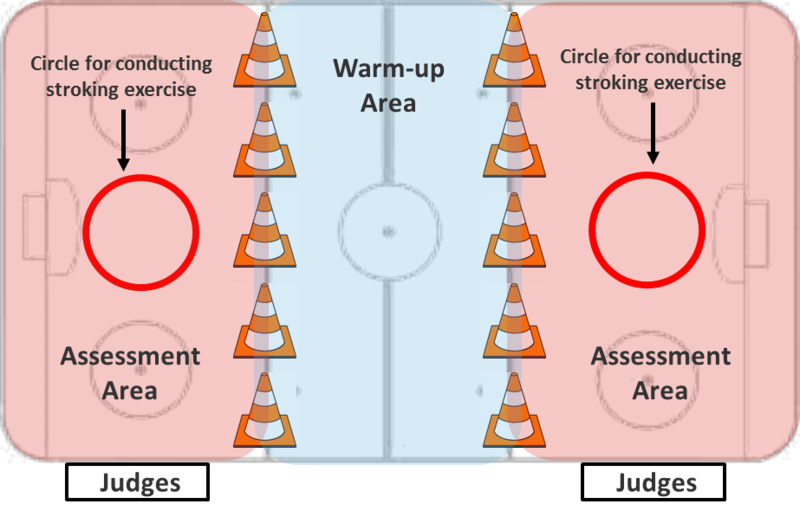 One or two rows of cones along the ice may be used to designate the warm-up and assessment areas. If the judges’ stand is not at ice level (i.e., situated in the players’ box) the judges (3) will be at the boards rink side. All assessments are initially written on paper so no computer equipment or power is required rink side. As each group being assessed completes their spin elements, the ice captain will invite the next group of skaters and their coaches to begin warming up in the designated area. This is an optional position for STAR 1 events. The On-Ice Assistant’s role is to keep groups moving and organized on the ice and to ensure they are moved from the warm-up area to the assessment area in a timely fashion. The On-Ice Assistant must wear skates. This is a good role for experienced Program Assistant’s or Coaches who may not have skaters involved in the competition. We recommend each skater wear a name tag. Sticky tags to be worn on a warm-up jacket are preferred. Tags attached by neck strings or lanyards are not permitted. Music for the 30-second creative routine is provided by the Section. A different selection of music should be played for each group, rotating through all the selections. Depending on the number of groups some music selections may need to be repeated. The music is played for the skaters twice: once to listen to and then again to perform. Soft background music is to be played during warm-ups and element assessments. STAR 2 and STAR 3 introduce skaters to performing elements in a program. It is very similar to higher level events where there is a timed warm-up for each group of skaters followed by performances of individual programs. Judges assess each program as per regular competition-like set-up and procedure. At the conclusion of the STAR events, each skater is presented with a report card and a ribbon or rosette corresponding to their overall assessment. A headset must be provided for each member of the panel of judges (the Referee plus two judges). If available, an additional headset should be set up on the panel for training purposes. Timers are not required for STAR 2 or STAR 3 events. STAR 4 marks the entry point into competitive skating where skaters are scored and ranked. Medals (or ribbons – at the discretion of each Section) are awarded to the top 3 finishers. All STAR 4 competitors will receive a report card listing assessments for each element and program component as well as their overall ranking. Programs should be timed as per all other free skating categories. The STAR system is designed to introduce skaters to performing and eventually competing. Ensuring that STAR 1-3 is conducted in a fun, relaxed and non-competitive environment is essential. The presentation of report cards and ribbons is a very important part of the process for skaters and parents and this can greatly affect their overall experience. Overall assessment ratings may NOT be posted in the venue or online via social media (i.e. Club website or Facebook page). 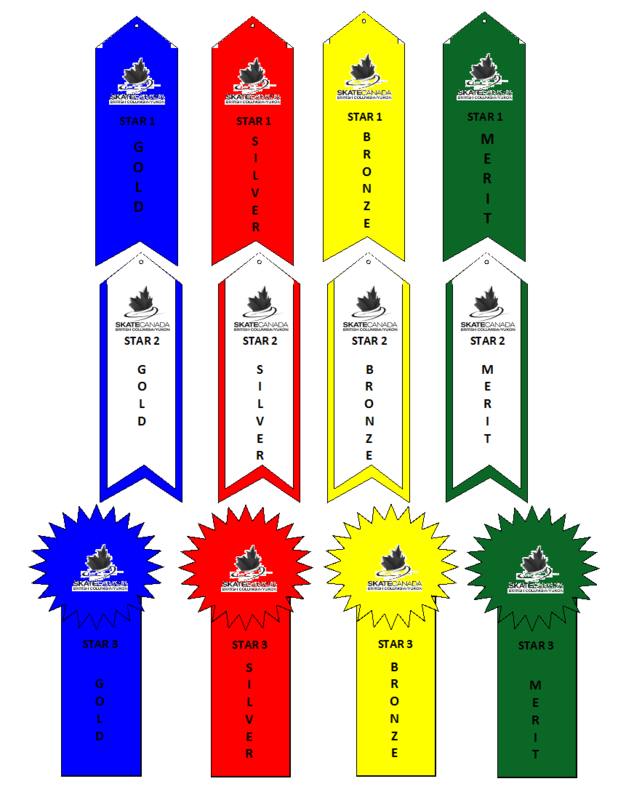 There are separate ribbons for each level of STAR 1-3 and for each of the assessment levels of Gold, Silver, Bronze and Merit. It is recommended that a simple ribbon design be used for STAR 1, a more elaborate design for STAR 2 and even a rosette be given for STAR 3 to reflect the advanced achievement of skaters at each level. Medals (if used) should only be reserved for STAR 4 and higher events where skaters are ranked. While numbers vary between areas, a rough estimate of ribbon distribution at each level is as follows. Note that averages will change over a season as skaters improve in each category. An individual report card is produced for each skater in STAR 1-3. This report card shows their individual rating on each element and the overall assessment rating. 1. Announce the name of the group that will be receiving presentations. Explain that each skater will be called forward and presented with their ribbon and report card and parents may take a picture of their skater. Tip: Parents should be provided the first opportunity to photograph their skater before a professional photographer. 2. Call up each skater to the podium or presentation area according to the starting order for their group. Present each skater with their report card and ribbon once they are on top of the podium or middle of presentation area. Do NOT announce the overall rating. Tip: If an assistant is available, have them check with skaters on the pronunciation of their name prior to presentations. They can also help the skater onto the podium for their presentation. When each skater is made to feel special, they and their families leave the event with good memories regardless of their performance. Choosing the right person(s) to perform the presentation ceremonies and create this positive atmosphere should not be overlooked. While teens and other skaters are valuable volunteers at an event, ribbon and medal ceremonies should only be performed by adults. 1. Sort skaters by age and place into an equal number of groups with no more than 6 skaters per group. Six skaters is the maximum number per group for on-ice management and the result calculation software. Girls and boys may be grouped together if numbers warrant this. If girls and boys are grouped together, ensure events are titled appropriately in the schedule (i.e. groups should not be called STAR 1 Girls Group 1 if boys are part of this group). If there are a sufficient number of boys, they may be grouped together regardless of age (i.e. 2 or more boys). 2. Review and alter groupings to keep some skaters with the same coach together. Because coaches will be on the ice with the skaters, it can be helpful for a coach to have some of their skaters together. Regrouping should NOT result in having all the skaters from the same club together. A reason for regrouping would be Groups 1 and 2 contain skaters of all the same age. A coach has one skater in Group 1 and one skater in Group 2. Place those 2 skaters in the same group. 1. Group 1: 25 minutes for 6 skaters. This includes a 3-4 minute warm up. 2. Groups 2+: 20 minutes. Groups 2+ will start warming up when the group before finishes assessing spins. Warm-up times are approximate and not meant to be exact. Sort skaters by age and divide into groups. It is recommended that skaters are assigned to a maximum of 12 skaters per group (flight), however, 8 is optimal as only one warm-up group is required. Although skaters are not competing against each other, groups should not be so large that skaters lose the sense of who is in their group. Girls and boys may be grouped together if numbers warrant this. If girls and boys are grouped together, ensure events are titled appropriately in the schedule (i.e. groups should not be called STAR 2 Girls Group 1 if boys are part of this group). If there are a sufficient number of boys, they may be grouped together regardless of age. Boys events should be held so long as there are at least 2 boys entered in a STAR event. STAR 2 consists of a maximum 2:00 minute program. Warm-ups are to be 3:00 minutes in duration. A review time of 1:00 to 1:30 minutes per skater should be included to allow the judging panel time to review elements and verify well balanced program criteria have been met. 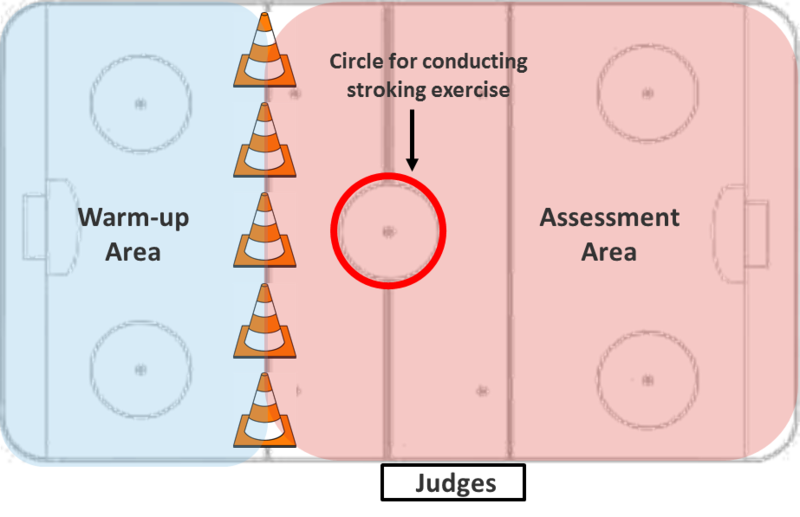 OPTION: If two panels of judges are available, panels may alternate with one panel assessing skaters with an odd starting number (i.e., #1, #3, #5 etc.) and the second panel assessing skaters with an even starting number (i.e. #2, #4, #6 etc.). Double panels should only be used when there is a limited amount of ice time available and a high number of entries. There should be an adequate number of officials available in order to proceed with double panels. Note the timing guide below is for panels that are assigned using experienced officials or panels of new officials in assessing STAR. Sort skaters by age and divide into groups. It is recommended that skaters are assigned to a maximum of 12 skaters per group (flight), however, 8 is optimal as only one warm-up group is required. Although skaters are not competing against each other, groups should not be so large that skaters lose the sense of who is in their group. Girls and boys may be grouped together if numbers warrant this. If girls and boys are grouped together, ensure events are titled appropriately in the schedule (i.e. groups should not be called STAR 3 Girls Group 1 if boys are part of this group). If there are a sufficient number of boys, they may be grouped together regardless of age. Boys’ events should be held so long as there are at least 2 boys entered in a STAR event. Groups should be kept small, no larger than 12 skaters. 1. Sort skaters by age. Boys and girls must compete separately in STAR 4 events. There are three age categories for STAR 4 events: U10, U13, and 13&O. If there are not enough skaters to form a separate age category for one of these groups, age categories may be combined if necessary. For example, if there are not enough entries to form a group in the Under 10 (U10) category, they may be combined with the skaters in the U13 category. 2. Divide age categories into groups (if necessary). Depending on the number of entries in each of the three age categories, skaters can be further divided into groups within these age categories. It is recommend that skaters are assigned to a maximum of 12 skaters per group (flight) with 8 skaters per group being the optimal number so only one warm-up group is required. STAR 3 and STAR 4 consist of a 2:00 minute (+/- 10 seconds) program. Warm-ups are 4:00 minutes in duration. OPTION: For STAR 3 ONLY, if two panels of judges are available, panels may alternate with one panel assessing skaters with an odd starting number (i.e., #1, #3, #5 etc.) and the second panel assessing skaters with an even starting number (i.e. #2, #4, #6 etc.). Double panels should only be used when there is a limited amount of ice time available and a high number of entries. There should be an adequate number of officials available in order to proceed with double panels. *NOTE: Double panel can only be used in STAR 3. Active Skate Canada Judges, Technical Officials, or Coaches who have completed the STAR 1-4 Officials training may officiate in STAR 1-4 events. Technical Officials include Technical Specialists, Technical Controllers or Base Level Technical Officials. Referee Ensures event runs smoothly. Addresses any on-ice issues that arise during event. Referee also acts as judge 1, 2 or 3. Try to assign an experienced STAR judge. Judge 1 Able to confidently apply standards and call out element assessments as skater is performing. Not all STAR judges will want to act as judge 1. Judge 2 Must record element codes correctly. Leads discussion of review of assessments as necessary. Submits marking sheet to data specialists. Ensure the person assigned is able to record accurately. Judge 3 Records elements and assessments for back-up purposes. Participates in review process. Excellent position for new STAR judge. May be a good role for someone who does not want to take a leadership role on panel.